The Lake Country Property Owners Association, Inc. (LCPOA) is a voluntary organization. The Association started in the mid 1970’s (1976 as best we can determine) as a properties owners group which did not include the developers. George Ireland was the first President of the Association. To view LCPOA By-Laws click here. The LCPOA received its Texas State Charter on May 21, 1984 and became the Lake Country Property Owners Association Inc. and is the dedicator to Lake Country Estates & Lake Country Secret Harbor. The Charter members are Joyce Norris, Randy Mosley, and Dianne Schafer. The members of the first Board of Directors were Aimee Krause, Kimberlee Long, Joan Polinsky, Henry J. Stocker, John Petelin, Randy Mosley, Joyce Norris, and Dianne Schafer. This corporation shall be for the purpose of promoting the civic community welfare and pride among the residents and non-resident property owners of Lake Country Estates, an addition to Tarrant County, Texas; conducive to good planning and sustaining property values, of securing desirable improvements and benefits for the addition and to foster and assist in the general civic and social enterprises and activities which may be beneficial to the community. The Lake Country Estates Owners Association (LCEOA) is the predecessor to the LCPOA and was a mandatory association. The LCEOA received its Texas State Charter on August 31, 1971 and forfeited it on February 21, 1983.
Who built Lake Country? The original developers are Patricia Craus, Joe Ann Shelton, Loeen Bushman, Jeanette Cogdill Baker and they formed Lake Country Estates Inc. in 1971. 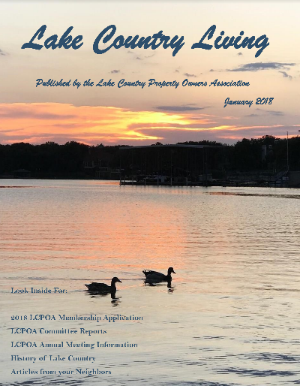 Lake Country Property Owners Association, Inc. is an organization for promoting the community welfare and pride among the resident property owners of Lake Country Estates and Secret Harbor. LCPOA Board of Directors meets the first Thursday of each month starting at 7:00PM at the Fullness in Christ Church Community Center located at 8895 Random Road.